It is often said that what happens in the Arctic does not stay in the Arctic but affects the world at large. Likewise, what happens in the world at large also has significant implications for the Arctic. As the region continues to be a target for the attention of external actors, investment flows will be impacted by external geopolitical events and alliances, which will in turn increasingly shape the Arctic’s future governance. With the global system of allegiances and alignments more fluid than they have been in recent memory, bilateral ties between Arctic and non-Arctic sates will assume greater importance for the region’s future in the coming years. Saudi Arabia is the latest country to be drawn to the region by the prize of Arctic resources. The primary means for this engagement appears to be through fostering closer ties to Arctic state Russia. The two countries have formed a close working relationship previously on oil prices, and recent indications suggest that collaboration will now spread to the region through natural gas production, specifically through Saudi involvement in the Arctic Liquid Natural Gas (LNG2) project. Saudi foreign policy, for years largely insular and focused on its immediate neighbourhood, has undergone a substantial shift in the last decade. An increasingly outward looking Saudi Arabia looks poised to use its influence in global energy markets to become a major Arctic player. With the Western world focused on the murder of journalist Jamel Khashoggi, at the India Energy Forum in Delhi in October 2018, Khalid Al-Falih, Minister of Energy, Industry and Mineral Resources of Saudi Arabia and Chairman of the Board at Saudi Aramco, confirmed Saudi interest in purchasing a stake in the Russian Arctic LNG 2. This announcement came days after Russian businessmen had flooded the ‘Davos in the Desert’ conference widely boycotted by their Western counterparts. Saudi Arabia and Russia are two of the largest global oil producers and ‘petro politics’ forms the key and enduring part of their bilateral relationship. Despite different preferences over the pricing of oil on the global market, cooperation between the two states has largely endured on the issue over the last decade. The best example of this cooperation is the 2016 ‘grand bargain’ struck between Saudi Arabia, Russia and China to stabilise global prices. In June 2018, Saudi Arabia and Russia were the primary champions of a nominal increase in production, agreeing with the Organisation of Petroleum Exporting Countries and producers outside the bloc to endorse an output increase of up to 1 million barrels a day. Recently, despite US objections, the two agreed in Vienna at December’s OPEC meeting to targeted cuts to global production. Arctic LNG-2 is a key part of Russia’s plans to capitalise on its vast Arctic resources. The project aims to construct a liquid national gas plant (LNG) with the total capacity of 18m tonnes in the Gydan Peninsula. Once completed, the pipeline will be able to export significant quantities of LNG to Europe, as well as tap into the rapidly developing Asian market. Novatek have stated previously that they are seeking external investors to finance around 40% of the project. Long-term French partner Total has already committed to a 10% share of the project, but a large portion remains open to foreign direct investment. Al-Falih’s statement along with the January MOU show a clear Saudi desire to acquire the remaining 30% stake in the $21 bn project. With vested interests in the fossil fuel market, it is unsurprising that both countries have recently collaborated to water down recent international climate legislation. Following the publication of the 1.5˚C report by the UN Intergovernmental Panel on Climate Change (IPCC), it was widely expected that the conclusions of the report would be largely embraced at the Katowice climate conference. However, Russia and Saudi Arabia worked in collaboration with the United States and Kuwait to limit the exposure the IPCC findings were given. The four countries objected to a motion to “welcome” the study, instead agreeing that it should merely be “noted”, making it far easier for governments to ignore. 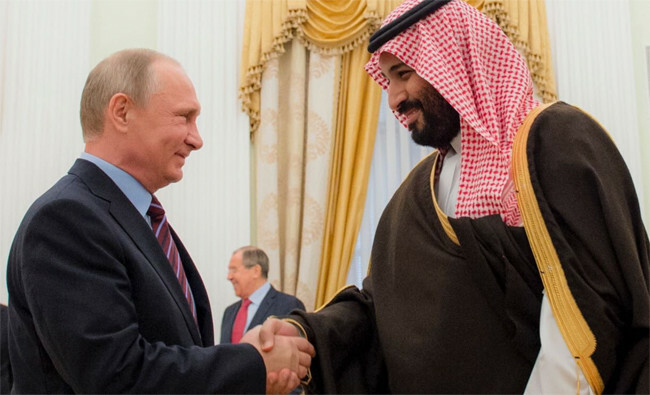 Wider media attention shifted to the relationship between Russia and Saudi Arabia following the enthusiastic greeting between Mohammed Bin Salman and President Putin at December’s G20 conference in Buenos Aires. The contrast with the awkward meeting shown by Saudi state TV between the Crown Prince and UK Prime Minister Theresa May was clear. Saudi Arabia is interested in developing its relationship with Russia as an international counterweight to its long-lasting relations with the US and, to a lesser extent, the United Kingdom. Despite the steadfast reluctance of both these partners to criticise Saudi Arabia, international pressure on the Kingdom and public pressure on its allies has been significant in the last few months. In the West, pressure on decision makers to reassess relations with Saudi Arabia has grown following the Khashoggi murder and Saudi conduct in Yemen. Now, opposition parties in Washington and London are in favour of wholesale reassessments of existing arrangements. Nevertheless, governments have found it difficult to challenge Saudi Arabia because of fears that it could endanger a lucrative and strategically important alliance while further destabilising the Middle East. For the Saudis, a partnership with Russia doesn’t suffer from such public relations constraints. Moreover, former points of contention such as Saudi support for Chechnyan independence and fighters has been largely irrelevant since the rise of the mutually acceptable Premier Ramazan Kadyrov. There remains some debate about the prospects of long-term cooperation on oil pricing and over the outcome of Syria’s civil war. However, Russia has an increasingly strong track record of single-issue cooperation with other potentially rival states when it is deemed to be within its national interest. As with other non-Arctic states the question remains how invested the Kingdom will become in the region. Saudi involvement in LNG-2 looks almost certain and could well indicate more investment in Russian oil and gas projects in the region. If Saudi Arabia does invest extensively, another international voice will be added to regional decision-making. While all Arctic states are rightly protective over their voices in deciding the future of the region, as other states invest, naturally their influence on their chosen Arctic partners will grow. We have already seen non-Arctic countries joining the Arctic Council as Observer states; perhaps in the future this is a distinction that Saudi Arabia will enjoy. With international scrutiny on the Kingdom at its highest level since the years immediately following 9/11, Saudi Arabia is looking to recast and reevaluate its key strategic relationships. Closer cooperation between Saudi Arabia and Russia will have far reaching implications, including for the Arctic. Richard Clifford is Fellow in the Geopolitics and Security Unit at Polar Research and Policy Initiative. Until recently, he also served as a Parliamentary researcher in the UK House of Commons. He has completed a MSc in Defence, Development and Diplomacy at Durham University and has an undergraduate degree in History and International Relations from the London School of Economics. Richard has experience working as a open source conflict analyst at Intelligence Fusion, and his research interests centre mainly on Russian foreign policy, in addition to geopolitical and security issues in the Arctic.